A companion for the more unusual, floral and complex spirits out there. As gins and other spirits are becoming more and more complex, the need arises for more complex mixers. 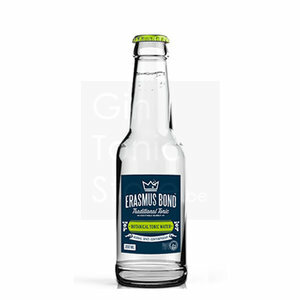 This is where Erasmus Bond Botanical Tonic comes into play. We have developed this complex concoction as a companion for the more unusual, floral and complex spirits out there. The introduction is made by a burst of Jamaican black pepper on the nose, swiftly followed by a touch of mint and a whiff of freshly cut herbs. The soft and round mouthfeel is accompanied by hints of candied ginger, basil, thyme, rosemary and juniper berries. As it comes to a finish the quinine is more obvious and is joined by gentian root, white grapefruit and a touch of pomelo. Nose: A burst of Jamaican black pepper and a touch of mint, then very herbal, reminiscent of freshly cut basil. Mouth: soft and round with hint of candied ginger, basil again, thyme, rosemary even, gentian root and juniper berries. Aftertaste: the quinine is louder now with loads of white grapefruit and pomelo. Een zeer zachte, doch niet zo'n bijzondere tonic. Wss voor specialist fijnproevers. We hebben die gemixt met de Black Tomato Gin en ze doet zeker geen afbreuk ad Gin smaak. Het was een zeer zachte smaak wat de combinatie erg bijzonder maakte.